As anyone who’s read the comments sections of previous on-line coverage of THE SILENCE will know, this is not a knockoff of A QUIET PLACE. It’s based on a Tim Lebbon novel first published in 2015, and was in the works before John Krasinski’s chiller, which has a very similar premise, became a sleeper smash last year. (The fact that screenwriters Carey and Shane Van Dyke’s previous credits include Asylum “mockbusters” like THE DAY THE EARTH STOPPED, PARANORMAL ENTITY and TRANSMORPHERS: FALL OF MAN is therefore an amusing coincidence rather than incriminatory evidence.) So, THE SILENCE is guilty not of being an imitation of A QUIET PLACE, but of telling a comparable story not nearly as well. 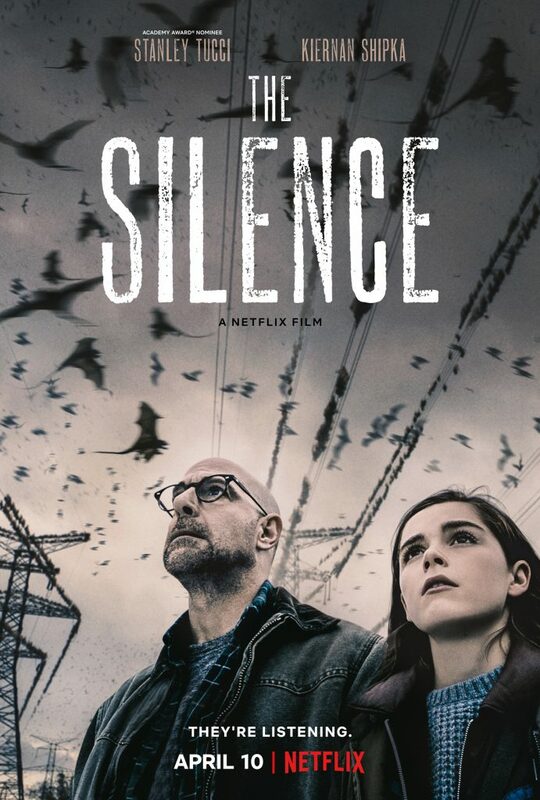 Even if the comparison isn’t entirely fair, scene after scene in THE SILENCE makes you realize just how much more well-thought-through A QUIET PLACE was in developing its premise. Instead of keeping the focus on the relationships among its threatened family and tightening the screws, THE SILENCE goes off on digressions that are familiar from other films and TV series, like STAKE LAND and THE WALKING DEAD. The movie also has an extremely on-the-nose way of introducing its central characters. When we meet deaf teenager Ally Andrews (Kiernan Shipka), some high-school bullies are mocking her; Ally’s suburban mom Kelly (Miranda Otto) is first seen with, no kidding, soccer balls falling out of her car. When dad Hugh (Stanley Tucci) tells young son Jude (Kyle Breitkopf) about a time his best friend Glenn (John Corbett) defended him in high school, Jude says, “I wish I was that brave,” and Hugh replies, “I have a feeling you might be.” Oy. The Andrewses are also able to safely talk with each other in hushed tones, and thus sign language isn’t necessary to their communication, which means that Ally’s deafness has pretty much no bearing on the narrative. (She can speak clearly because she only lost her hearing three years before in a car accident that killed her grandparents—a tragedy that also otherwise has no importance here.) Instead, they hole up in a remote farmhouse and play out a few scenarios seen in the undead-apocalypse opuses mentioned above and many others like them. There is one clever sequence late in the movie involving weaponized cell phones, a bright spot of creativity in a plot that is otherwise as underdeveloped as the characters. Director John R. Leonetti, not improving on a résumé that also includes ANNABELLE and WISH UPON, contributes generic atmosphere and a steady but unexciting pace, reverts to slow motion for scenes that would probably have been more dramatic at regular speed and muffs what should have been a great hero moment involving Hugh and a woodchipper. Never mind specific comparisons—THE SILENCE simply isn’t scary, gripping or believable enough on its own terms. The final implausibility—SPOILER ALERT—is Ally’s closing narration telling us that humanity’s survival rests on the vesps not liking the cold—rather unlikely for a species that bred in caverns deep beneath the Earth’s surface. Really? You do realise there’s a ton of freaking lava down beneath the Earth’s surface, right? And that temperatures only increase the deeper down you go? It’s called the geothermal gradient. In what world is the conclusion therefore ‘rather unlikely’? They were discovered while exploring mountains in West Virginia if I remember correctly. They were 1000 feet deep… in a mountain so they were still thousands of feet above sea level. According to https://www.wvencyclopedia.org/articles/1024, West Virginia caves are about 52 degrees on average. That’s not very Volcanic. Many of my family members have worked in caves in West Virginia as coal miners. I have never herd any stories of them having to deal with lava. You seem upset that logical facts are being used to show that the premise of the movie is dumb. Perhaps you have a personal stake in it, but a swarm that size would not have enough food down there and if they couldn’t deal with cold then they wouldn’t have survived in caves in West Virginia. If I am wrong about anything that I have said, it was because the movie sucked so bad that I wasn’t willing to go back and verify what the movie said earlier on. That’s a good point. What we see of their environment in the opening scene looks pretty dank and cold, but clearly I needed the science lesson!